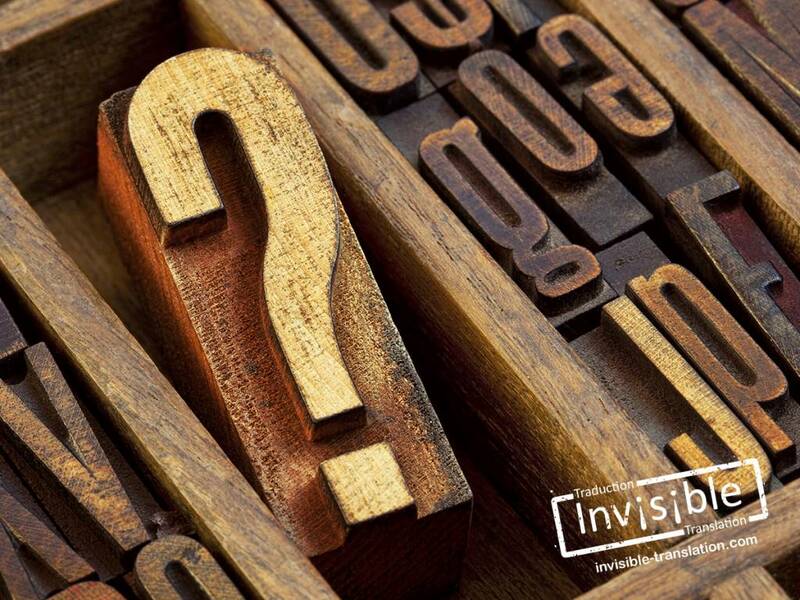 Frequently Asked Questions (FAQ) | INVISIBLE Translation Inc.
Is INVISIBLE Translation only a translation agency? No, INVISIBLE Translation is much more than just a translation agency. Our services include translation, advertising adaptation, editing and revision, proofreading and copy writing. Our firm consists of a team of professional language experts and linguists who are passionate about the English, French and Spanish languages, and who have pooled their skills to provide you with a variety of high-quality language services. What language combinations do you translate? In which industry sectors do the members of your team have experience? Our team covers many sectors, but a few key areas of experience include environmental technologies; advertising and marketing; computer science; organizational psychology; commerce and the economy; real estate; administration; education; sports; oenology and viticulture; mineralurgy, ore processing and mining. I would like to request your services. How do I proceed? It is quite simple. Just click on this link and complete the form that is displayed. You may also send your documents and the relevant information here: quote@invisibletranslation.com. 3. send us the documents we will need to carry out your assignment. Once we have received everything we need, we will send you a free service offer within 24 hours, with no obligation on your part to retain our services. If you are in a rush, you can call us at +1 514-436-6331. How do I send you the documents that you need for the quote? You can send us your documents by email, fax, mail, registered mail or courier. You can also use this form or bring them directly to our office. How much time do you need to assess the work involved and to send me a quote? No more than 24 hours. We will email or fax you our service offer as quickly as possible, usually in less than an hour. You can send us a certified cheque or bank draft by mail, by registered mail or by courier. You can also pay by bank transfer, electronic transfer, or wire transfer to our business account. As well, we accept credit card payments through Square and PayPal‘s secure site. Can I obtain a discount for quick payment? Yes. If you pay the full amount within ten (10) days of the invoice date, we will credit your account with two percent (2%) of the invoice you have paid quickly. So you will deduct this two percent (2%) from my next invoice? That is correct. Let’s say that the invoice for project A comes to $1,000 and you pay that full amount within ten (10) days of the invoice being issued. We will then credit $20 (2% of $1,000) to your account, to be deducted from the invoice for project B. Do you offer preferred rates to non-profit and charitable organizations? Yes, we provide a discount of three percent (3%) to non-profit organizations listed on the Quebec Enterprise Register and to charitable organizations registered with the Canada Revenue Agency. Do you offer preferred rates to organizations dedicated to protecting the environment? We provide a discount of three percent (3%) to certified green businesses and members of provincial networks affiliated with the Canadian Environmental Network. What if I have questions while the work is in progress? You can reach the project manager for your project by phone or email during our agency’s office hours, who will be pleased to answer all your questions. If you cannot reach your project manager, simply call us at this number: +1 514-436-6331. Are the translators in your team members of a Canadian professional association? The vast majority of the translators working for our translation agency are registered with the Association of Translators and Interpreters of Ontario (ATIO), the Ordre des traducteurs, terminologues et interprètes agréés du Québec (OTTIAQ), which is Quebec’s association of professional translators, terminologists and interpreters, or another professional member association recognized by the Canadian Translators, Terminologists and Interpreters Council (CTTIC). Some of our colleagues are also members of foreign associations, such as the American Translators Association (ATA) in the United States or the Chartered Institute of Linguists (CIOL) in the United Kingdom. Is this also true for your editors, revisers and proofreaders? Several of our editors, revisers and proofreaders are members of Editors Canada (EC). We also rely on a number of experienced translators to edit and revise work produced by our team. This is in line with the quality control process INVISIBLE Translation has established. Several of our writers are members of the Société québécoise de la rédaction professionnelle. Gifted with a wide range of experience, our copy writers and technical writers are seasoned professionals with excellent writing skills, enabling them to produce consistent and flowing text, with impeccable grammar. What distinguishes the work of a professional from that of a non-professional? Just a few factors are sentences that flow, a logical stream of content, readability, judicious use of link words and collocations, grammatical concordance of tense, proper usage, and avoidance of foreign-sounding text due to misappropriation from the source language, such as barbarisms, deceptive cognates, misused jargon, interference, solecisms and zeugmas. How much time do you need to translate a document? This depends above all on the nature of the text to be translated (scientific, technical, administrative, etc.) and the number of words involved. As a general guideline, every translator on our team can translate between 1,500 and 2,000 words per day produced at a professional level. How do you calculate your fees for translating a text? Our fees for translation services are determined using an assessment chart that considers a number of criteria, especially the number of words in the document submitted for translation, the deadline you give us, the format (.doc, .pdf, .pub, .indd, etc.) of your electronic files, etc. Based on this, we set a per-word rate and then multiply this rate by the number of words in your text. Do you bill translation services only by the word? Not necessarily. We use an hourly rate for files that require extensive handling, such as PowerPoint documents or those with sections already translated. We use the same approach for translating official documents (birth and marriage certificates, driver’s licences, academic transcripts, etc. ), which require extensive page formatting to reproduce the layout of the original document. Our translation services for advertising are also billed by the hour, since adaptation of a three-word slogan, for example, takes much more than a few minutes. In these cases, billing by the word is obviously inappropriate. How much time do you need to edit, revise or proofread a document? This depends on the quality, clarity and nature of the text we will be reviewing, how technical it is, and how many words it contains. For example, it usually takes longer to edit, revise or proofread a 5,000-word assignment of rights than a training program of the same length. Also, a skilfully written text will take less time to edit, revise or proofread than a hastily drafted document. In addition, please note that the editing process involves more work if the document you submit has been previously translated, since we must then compare the translated version with the original. How do you calculate your editing, revision and proofreading fees? Our editing, revision and proofreading fees are determined by multiplying our hourly rate by the number of hours we will need to carry out thorough editing and revising as well as systematic proofreading of a given text. Are your editing and proofreading services billed only by the hour? Not necessarily. We charge by the word for editing or proofreading a large document over the course of several weeks, so the client can have a firm price for the project up front. We use an assessment chart based on various criteria (language of the work, quality of the writing, number of words, nature of the text, technical level, etc.) to set our rate, which we then multiply by the number of words in the text to be edited or proofread. How much time do you need to write a text? This depends on the type of text to be written, the projected length, and the amount of research needed before beginning the actual writing. For example, preparing a press release will not present the same difficulties as drafting a technical user’s handbook. How do you calculate your fees for writing a text? Our copy writing and technical writing fees are determined by multiplying our hourly rate by the number of hours we will need for research and writing, followed by proofreading the text. What kinds of text are you able to write? Our writers are asked to draft a wide range of administrative and technical documents: commercial and marketing brochures, project specifications, press releases, reports, advertising brochures, guidelines, applications, presentation files, instruction sheets, service manuals, operation manuals, memoranda, technical notes, employment offers, proposals, procedures, work programs, and many more. Do you have a quality-control procedure? Yes. Every project that we carry out is carefully checked by our editing, revision and proofreading team to ensure strict quality control. In other words, the text that we have translated, adapted or written in compliance with your requirements is then reviewed by one of our team’s editors or revisers. Reviewing the text with a fresh eye, the reviser can analyse and correct it in minute detail, in addition to refining the style and content of this text. How do you ensure that the translated text is a true reflection of the original? When the translation stage is finished, one of our revisers checks the accuracy of the translated version and the equivalence of both documents by placing them side by side, to compare each sentence of the original document with its translation. The reviser makes any necessary changes, ensuring that the translated text meets our stringent quality standards. How do you assign work to the various members of your team? During the first stage of the process, one of our project managers carefully analyses the nature of the assignment we receive, and then forms a team of language professionals who have proven knowledge in the given area of specialization. For a translation project, the team members assigned to the project are also native speakers of the language into which the text will be translated. What do you mean by “native speaker”? A person is considered a native speaker of English if the first language they learned in childhood was English, and English is still their primary language. I have heard of “machine translation”. What is that, exactly? Briefly, the expression machine translation refers to the translation of a text using software. Such software does not have the capacities of logic, consistency and creativity that are unique to the human mind. Do you use machine translation to translate your clients’ documents? No. We never use machine translation in any way or form. Why did you choose the name INVISIBLE Translation for your organization? In our opinion, a translation should be invisible when compared with the original. In other words, we believe that readers should not suspect that they are reading a translation. This page provides an insight into the concept behind the name of our business. Where can I find a full list of the services you provide? Simply read this page. You can learn the difference between unilingual and bilingual revision, or find out about our consulting services. Have you drawn up a list of the benefits you provide to your clients? Yes, we have produced a page for this purpose. You will see that we offer competitive rates and genuine benefits that maximize the return on your investment while providing you with professional service of unmatched quality. Our head office is located right in downtown Granby, Quebec, Canada, in the heart of the Montérégie region near Montreal, one hour’s drive from the United States border. 6 – WHAT IF I HAVE OTHER QUESTIONS? Call us immediately at this number: +1 514-436-6331. You can also reach us at the following email address: questions@invisibletranslation.com. We encourage you to send us your comments and suggestions about how we can serve you better: info@invisibletranslation.com.